Zondervan recently released the newest book in their often helpful Counterpoints series called Three Views on the New Testament Use of the Old Testament, edited by Ken Berding and Jon Lunde. Both teach in the Biblical Studies department at Biola University as members of the faculty of Talbot School of Theology. Dr. Lunde and Dr. Berding: thanks for taking the time to answer a few questions about the new book you edited. Maybe you could start by giving us a basic overview of what the book covers. Ken Berding & Jon Lunde: Thank you for inviting us to dialogue with you a bit about this. We’re really glad to be able to introduce you to the book! 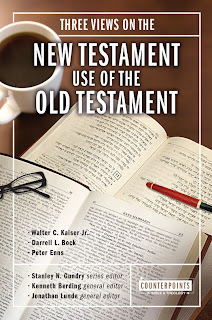 Three Views on the New Testament Use of the Old Testament is an introduction to the essential issues one faces when studying the way NT authors employ OT texts. The “gravitational center” of the discussion is the relationship of the OT author’s intended meaning to the NT author’s intended meaning. Are those meanings essentially the same, connected in some fashion without being identical, or disconnected? If that is the “gravitational center,” there are five questions that “orbit” around this central issue. It was around these five questions that we decided to organize the book. Is sensus plenior an appropriate way of explaining the NT use of the OT? We do recognize that there are scholarly variations on each of these views represented within the broadly-defined evangelical world. So the reader should consider our contributors as general spokesmen for the camps they represent, but by no means as exhausting the nuances within those camps. For example, though Kaiser’s view is broadly similar to the view espoused by John Sailhamer, it would be unfair to either of them to assume that the ways they argue their respective cases are univocal. This is a short book seeking to provide both the general contours of the discussion and specific representatives within those general categories. How did you two become interested in this subject? Jon: Though I was curious about the issue throughout my MDiv and ThM days, my curiosity became a passion when I took Don Carson’s seminar on the topic in my doctoral program at Trinity. I continued sharpening my understanding of the pertinent issues during the writing of my dissertation on Matthew’s apocalyptically-colored, salvation-historical perspective. Then, when I was asked to teach a capstone class for our Bible majors at Trinity College in 1996, I decided to develop a seminar that would delve into the hermeneutical and exegetical issues involved in the NT use of the OT, while at the same time remaining accessible to underclassmen. Consequently, this topic has been on the front burner for me for a long time. Ken: I became interested in this subject during my doctoral studies at Westminster Seminary during the mid-90s. That topic, perhaps more than any other topic during that period, seemed to occupy the minds and conversations of professors and Ph.D. students at Westminster. I also wrestled long and hard with the issue of how citations, allusions, and reminiscences functioned in texts in my doctoral dissertation (later published by Brill), Polycarp and Paul: An Analysis of Their Literary and Theological Relationship in Light of Polycarp’s Use of Biblical and Extra-Biblical Literature. That study in particular made me sensitive to the ins-and-outs of trying to identify uses of earlier literature by later authors. It seems that with the release of Beale’s and Carson’s new commentary as well as this book, there is burgeoning interest in this issue. Would you say that’s true? Jon: This needs to be answered with a bit of nuance. On the one hand, the use of the OT in the NT has been of vital interest to Christians all the way back to the first centuries of church history. In fact, I think it is safe to say this was central to the very first Christians. This interest has grown in the past century, evidenced by numerous scholarly treatments of various issues within the debate. On the other hand, awareness of its importance has been growing more recently on a broad level among professors, pastors, and lay people who are not specialists in the field. Since most MDiv programs do not offer classes specifically on this issue, most pastors have never been equipped to think through the hermeneutical challenges that the NT use of the OT offers. Consequently, they have typically not included in their sermons the sorts of discussions that would have piqued the interest of their congregations. So, the publication of the Beale/Carson commentary may very well be changing the situation—providing helpful discussions for the already-interested non-specialists, and awakening many others to the problems and potential that this field offers to the church. Hopefully, our volume will make this discussion even more accessible to this broader audience. Especially for the benefit of those not familiar with this issue, why do you think it is important to raise it? Or put another way, what are we missing if we do not ask this question? Jon: For a long time, conservatives have appealed to the NT use of the OT primarily to enhance its apologetic for the truthfulness of the NT claims about Jesus—how can anyone help but conclude that Jesus is the Messiah when the full range of prophetic fulfillment in relation to him is taken into account? Unfortunately, when many of these fulfillments are studied carefully, questions about the legitimacy of the NT writers’ interpretive approach to the OT arise, somewhat qualifying the convincing nature of this apologetic. But when the NT hermeneutical and exegetical methods are understood, most of these problems are resolved, even though the apologetic question may not be answered in exactly the same way again. More importantly, however, the theological depth of their OT reading becomes visible. That is to say, the theological appreciation for the ways in which the NT writers understand Jesus’ relationship, not only to the particular words of the OT prophets, but to the entire history of God’s interaction with his people in the OT will be expanded and deepened. This is why I tell my students that the importance of studying the NT use of the OT is less for the purpose of enhancing the convincing nature of our apologetic for non-disciples, and more for the purpose of deepening disciples’ understanding of the significance of Jesus. If the church wakes up to this dimension of the NT use of the OT, it will recover the profound perspective that the first Christians had in relation to Jesus—a perspective that enlivened a mission that changed the world. What areas of this discussion do you personally find to be the most difficult? Ken: Probably the hardest issue for me right now is whether I should assume that the OT authors always read the OT—for lack of a better word—richly, or whether some of their uses of the OT are thin readings. Even though I tend to think a rich reading is occurring in most instances, in some cases—at least on the surface—some NT uses of the OT look thin to me. It is difficult to know whether to leave them the way I am seeing them initially, that is thin, or whether I should work harder to find grand canonical trajectories with which they should be connected. Who are some of the people who have most influenced your thinking in this area and how? Jon: As I already noted, Don Carson’s PhD seminar stimulated my thinking in a seminal way. But such writers as C. H. Dodd, Leonhard Goppelt, Klyne Snodgrass, Doug Moo, Tom Wright, Greg Beale, Darrell Bock, Richard Longenecker, R. T. France, Craig Evans, A. T. Hanson, Pete Enns, Dan McCartney, John Sailhamer, and Walt Kaiser have all furthered this interest. Obviously, these writers have impelled me to consider the various ways in which the central questions have been answered by biblical scholars. Most of my work in the field has been inductive in the texts themselves. But being aware of the range of opinions has been very helpful to keep me from viewing the evidence from simply one viewpoint. Are the three positions laid out in this book tied to any particular Protestant traditions or systematic theological commitments? Ken: No, I don’t think that these three views are necessarily connected to any particular theological grid, at least regarding the central issues discussed in the book. Is there any reason that a dispensational interpreter couldn’t at any level affirm the idea of a “Christotelic” impulse to the Old Testament? Or is there any reason that a Reformed interpreter couldn’t agree that a NT author might be attentive to the context of an OT passage? Of course, on any one of the many sub-questions that attach to this topic, a particular tradition might be more prone to move one way or another. But on the larger questions addressed in this volume, it seems possible that there might be opposing positions even among those who are in the same tradition. Thanks for taking the time to fill us in on this important issue! "This is why I tell my students that the importance of studying the NT use of the OT is less for the purpose of enhancing the convincing nature of our apologetic for non-disciples, and more for the purpose of deepening disciples’ understanding of the significance of Jesus. If the church wakes up to this dimension of the NT use of the OT, it will recover the profound perspective that the first Christians had in relation to Jesus—a perspective that enlivened a mission that changed the world."